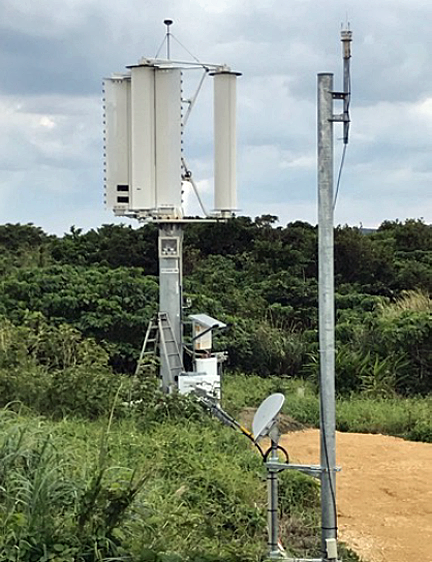 By FY2019, Challenergy Inc. and SKY Perfect JSAT Corporation will be collaborating with the aim of commercializing a service that combines wind power and satellite communications primarily for countries and regions with poor access to electricity and communication infrastructure — a joint demonstration test was initiated in Okinawa Prefecture on January 10, 2018, as the first step of this collaboration. The global wind power market (including offshore wind power) is expected to expand to 9.7 trillion yen by 2030.1 The Magnus Vertical Axis Wind Turbine ("Magnus VAWT") currently being developed by Challenergy makes stable power generation possible even in strong wind and turbulence. Furthermore, as it does not rotate at fast speeds like conventional propeller wind turbines, the Magnus VAWT reduces environmental impact, such as noise and bird-strike accidents. There are expectations placed on Magnus VAWTs as the world's first technology that is suitable for use on remote islands and in mountainous areas, where propeller wind turbines are not suitable for use due to accident and breakdown risks. Up to now, such areas have had no choice but to depend on diesel generators, which are costly and place a high burden on the environment. Photo of the test station. Meanwhile, the strengths of satellite communications are the provision of advanced communications services in digital divide areas, such as remote islands and mountainous regions, as well as the use as disaster restoration communications following large-scale natural disasters. However, electricity is indispensable for the communications equipment on the ground. Magnus VAWT will enable the stable operation of such communications equipment on the ground even on the above mentioned areas, where there have been difficulties in securing electricity. It will also maintain communications even after disasters, in case that the interruption of power is a concern. The collaboration between Challenergy and SJC will further reinforce the biggest benefit of satellite communications—to be connected anywhere and at any time. SJC plans to strengthen its solutions toward Japanese domestic disaster communications demand, which calls for even further advanced and sound use, as well as expand the services to the world's digital divide areas, such as Southeast Asia and Pacific island countries, which have poor access to electricity and communication infrastructure. 2. To operate a system that can monitor the operational state of the test unit through satellite communications. 3. To maintain autonomous WiFi internet communications using the test unit and satellite communications. In September 2017—in advance of the aforementioned joint demonstration test—Challenergy and SJC were jointly selected for the Japanese Ministry of Economy, Trade and Industry (METI) "Fiscal Year 2017 Climate Change Adaptation Effect Visualization Project (Contribution visualization project of Japanese private sector in the field of adaptation in developing countries)"2.
the Philippines is increased damage and delayed disaster restoration due to the interruption of power and communications from frequently-occurring typhoon disasters. About 550,000 people were afflicted in the Philippines by typhoon damage in 2017.3 What is more, the basic infrastructure of power and communications is poor in its remote islands even during ordinary times. In fact, 45 percent of the Philippines' total population is still living without internet access4, and the demand for power and communications is expected to rapidly increase going forward. Aiming to provide a stable power supply and communications environment through the use of the Magnus VAWT, Challenergy and SJC also plan to provide after-sales services of Magnus VAWT. An after-sales service network of Magnus VAWT — which will monitor in real time the operation of the turbines as well as need for repairs and maintenance through satellite communications—will be built with the aim of providing reliable after-sales services in any country or region around the world. The two companies will carry on joint feasibility studies, targeting to provide a Challenergy's Magnus VAWT with SJC's satellite communication services by FY2019, and will further explore other business possibilities beyond current collaboration. 2A project with the objective of carrying out feasibility surveys regarding the contributions toward emerging countries in application fields utilizing the superior technologies, etc., of Japanese companies, measurement methods and metrics formulation. The project has been in place since 2012.